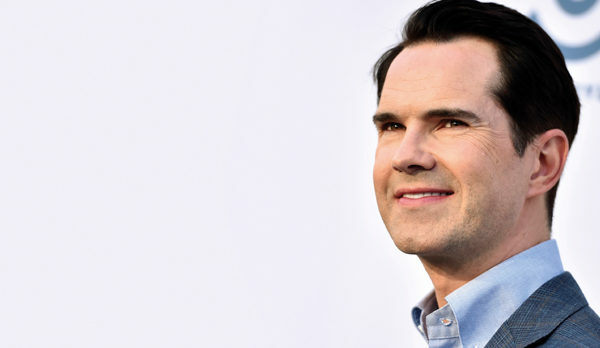 ‘I look like this because my dad is Irish and my mom is Roger Federer,’ Jimmy Carr announces, his face so boyishly sweet and innocent there’s not even a hint that he’s joking. Even his wardrobe is in on the deception: He has on a very serious, well-fitted suit – there’s even a waistcoat, although, mercifully, no tie. The chic attire is part of his act. He is, on appearance alone, not the sort of charming, well-groomed gentleman who would ever tell a lie. Would he? Except, of course, Carr is not the angel he appears to be. Rather, he’s a full-on stand-up comedian who, despite those youthful looks, comes with tons of experience and a penchant for absolutely deadpan delivery. Sometimes it’s so believable, so proper, you have to pinch yourself as a reminder that he’s delivering punchlines rather than rounding off a Sunday sermon. ‘I met Brad Pitt at a party,’ he’ll quip, nonchalantly. ‘They say you should never meet your heroes. But I think Brad handled it pretty well.’ It’s this kind of simple demonstration of his lateral way of thinking that’s earned him such wide appeal, making him one of the busiest and most successful comedians in the world. Not that all his jokes are quite so polite and inoffensive. He will, just moments after dropping a one-liner suitable for family television, throw in something sharp, prickly and likely to upset at least one sensitive soul. Then he’ll remind you – straight-faced – that ‘they’re just jokes’. ‘Well, most of them are jokes,’ he continues. ‘That last one really happened.’ And with that, he reveals his fondness for really dark comedy – ‘that last one’ happens to be a macabre joke about how he once skidded his car across the ice and hit three pedestrians. Ouch! But somehow it works as a multilevel joke, even with a few groans from the audience. Over the years, he’s had plenty of opportunity to rid himself of performance anxiety. Carr tours relentlessly and has put on over 2 000 performances, racking up massive audiences for both live and recorded shows. He was also – in 2007 – the first major comedian to perform in the virtual-reality world of Second Life. South Africans will soon be able to get a regular hit of Carr’s ribald humour when his smash hit show Your Face or Mine lands on Comedy Central (DStv channel 122) in November. Referred to as a game show for the Tinder generation, it revolves around couples rating each other on their hotness – as Carr puts it, it’s about ‘placing attractiveness on a pedestal above intelligence’. It’s perfect, he says, in a world where people are constantly evaluating one another based on looks. And if that’s not enough, Netflix has just announced that Carr is to host a new comedy panel show called The Fix, in which guests attempt to solve the world’s biggest problems. While many of his TV appearances depict him performing relatively squeaky clean jokes, he doesn’t necessarily hold back on swearing or punching below the belt when he’s in front of adult audiences. Sometimes there’s a sweet sting. ‘I tried to write the shortest joke possible,’ he says, ‘so I wrote a two-word joke, which was simply “Dwarf shortage!”’ Then, quickly, he adds: ‘If you’re a dwarf and you’re offended by that, grow up!’ This underscores that Carr is no fan of political correctness. He’s also especially well known for interacting with hecklers. He’ll go so far, in fact, to include segments dedicated to heckling, inviting audience members to take their best shots at him. Be warned, though, that you will never beat him at his own game – he is the master of devastating insults.